During the pre-season Ken Whitfield Moved away from Maine Road after just over a year at the club, signing for brighton for a fee of £3,500. In the boardroom Robert Smith stepped down as Chairman and Walter Smith took his place. City hadn’t played any pre-season friendlies and the press were buzzing with reports that City were to put in place a new continental style of play in their first game of the season at Deepdale, the journalists had christened it ‘The Revie Plan’. Obviously not quite as tuned as it should have been City ended up on their proverbial backsides as Preston took them apart and won 5-0. 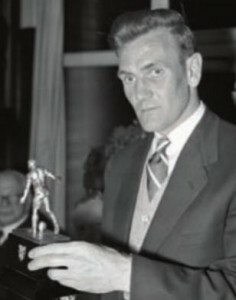 Despite the defeat Les McDowall pledged to stick with the ‘Plan’ for at least another month, determined it would succeed, he decided to change the personnel rather than the system bringing in Jimmy Meadows, Roy Little and Ken Barnes, the changes worked and City beat Sheffield United 5-2 and drew 0-0 against Burnley , both games at Maine Road. They then won three games on the trot, 2-0 at Sheffield United and by the same score at Leicester and then a 2-1 win at home to Arsenal , so after six games the Blues were well placed, fourth in the Division 1 on nine points, just a point away from early league leaders Manchester United. City then drew 1-1 against Chelsea at Maine Road and then an impressive 3-2 win at Arsenal saw The Blues move to the top of Division 1. The Blues slipped back with a 2-0 defeat at Cardiff , however in a classic ‘derby at Maine Road City beat United 3-2 and were snapping at the heels of new league leaders West Brom. A good 2-2 draw at Molyneux against Wolves followed but then City were surprisingly beaten 4-2 at home to Aston Villa , and then mirrored the same results drawing 2-2 at Bolton and losing 4-2 at home again, this time against Huddersfield . City also played two further friendlies in October, winning 1-0 at Millwall and 4-1 at Glasgow Rangers . November brought two wins and two defeats, a 4-2 win at Hillsborough against Sheffield Wednesday , a 2-1 defeat at home to Portsmouth , another good away win, 3-1 at Blackpool and another defeat at Maine Road 5-1 to Charlton . December brought another defeat 3-2 at Sunderland and after four successive games at Maine Road without a point City managed to draw 0-0 against Tottenham, then beat Preston 3-1 and on Christmas Day beat Newcastle 3-1. However maybe the Blues’ festive celebrations were overdone and the Magpies of Newcastle beat the Citizens of Manchester 2-0 two days later. The new year saw City continue with their bad league form as they lost 2-0 at Burnley on New Years Day. The FA Cup came as some respite for the Blues as they beat Derby 3-1 in the 3rd Round at the Baseball Ground. Back in the league on a snow covered Maine Road pitch City managed to gain a point in a 2-2 draw against Leicester . The Blues then started to hit some form as they beat Chelsea 2-0 at Stamford Bridge and then iin front of almost 75,000 fans at Maine Road they beat Manchester United 2-0 in the 4th Round of the FA Cup. City went on to beat Cardiff 4-1 at Maine Road and then in an amazing game at Old Trafford Manchester United were slaughtered 5-0. The Blues made it five wins on the trot as they beat Luton 2-0 in blizzard conditions at Kenilworth Road in the 5th Round of the FA Cup. Back in the league the last game in February saw a 1-0 defeat at Everton . 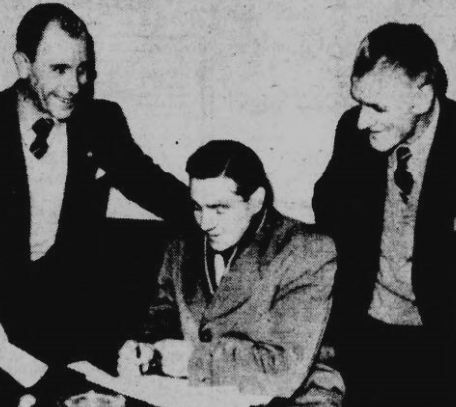 City added to their attack at the beginning of March when they paid Hibernian £22,000 for the services of 25 year old Bobby Johnstone. The first game in March saw a 2-2 draw at Tottenham before a great 1-0 win at Birmingham in the 6th Round of the FA Cup. Back in the league and Bobby Johnstone made his debut in a 4-2 home win over Bolton , and a week later, Manchester City drew 0-0 at Huddersfield , after seven minutes Hart collided with Gibson, Town’s right back, and was taken off with his left leg broken. Laurie Barnett, City’s trainer, wept that day, and I doubt whether he was the only one. The Semi-Final of the FA Cup was played at an extremely muddy Villa Park, and City beat Sunderland by a single goal to book a place at Wembley in the final. City’s next home game was against Sheffield Wednesday , and despite being without the luckless Hart and Revie and Johnstone, who were on international duty, the Blues still managed to hold the Owls to a 2-2 draw, but then lost 1-0 at Portsmouth . City enjoyed a good Easter at Maine Road, beating West Brom 4-0 on Good Friday and Sunderland 1-0 the next day pushing them into a possible race for the title, however a quick rematch with West Brom saw City lose 2-1 at The Hawthorns. The Blues were 4th in the league on 43 points, one point away from Wolves in second and six points behind leaders Chelsea with just four games left to play. The Blues then drew 1-1 at Charlton and beat Wolves 3-0 at Maine Road and cut Chelsea’s lead at the top to four points. FA Cup fever hit Manchester with the final two weeks away when residents of Moss Side were kept up all night as a queue over a mile long staked it’s way around the streets surrounding Maine Road. They queued all night and when the box office opened the following morning all the tickets sold out within two hours leaving thousands ticketless and disappointed. Any chance City had of catching Chelsea disappeared with a surprise 6-1 defeat at home to Blackpool and the Blues also lost the last game of the season 2-0 at Aston Villa. City ended up in seventh place on 46 points. 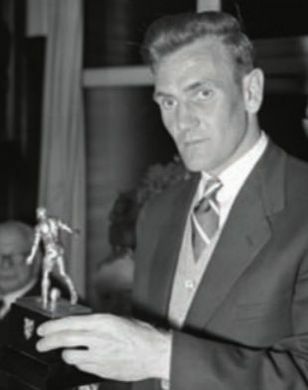 The day before the FA Cup Final Don Revie received the award for The Football Writer’s Player of The Year, the journalists rewarding the City player for his part in the revolutionary ‘Revie Plan’. The FA Cup Final saw defeat for an unlucky City side as they lost 3-1 against Newcastle at Wembley.